Now that the director and returning cast of X-Men: Dark Phoenix has been revealed, fans are eagerly waiting for any further updates about the upcoming Marvel film. And now, it appears they've gotten one - in the form of a haircut. James McAvoy, who has played the younger version of Charles Xavier in the three most recent X-Men films, recently hinted that he will be shaving his head in preparation for Dark Phoenix. In an Instagram video, which you can watch below, McAvoy holds up a razor, with the caption's hashtags referencing the film. This isn't the first time that McAvoy has follically committed to the role of Professor X. After keeping his hair for the first two movies, McAvoy shaved his head for the end scene of last year's X-Men: Apocalypse. X-Men: Dark Phoenix currently has a 3.72 out of 5 ComicBook.com User Anticipation Rating. Let us know how excited you are for X-Men: Dark Phoenix by giving the film your own user anticipation rating below. X-Men: Dark Phoenix will be a direct sequel to X-Men: Apocalypse. The film will take place in the 1990s and will be inspired by "The Dark Phoenix Saga," the most popular X-Men story of all time. 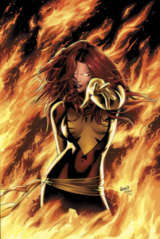 Dark Phoenix will be directed by Simon Kinberg, with a returning cast of McAvoy, Jennifer Lawrence as Raven/Mystique, Michael Fassbender as Erik Lensherr/Magneto, Nicholas Hoult as Henry "Hank" McCoy/Beast, Alexandra Shipp as Ororo Munroe/Storm, Sophie Turner as Jean Grey, Tye Sheridan as Scott Summers/Cyclops, and Kodi Smit-McPhee as Kurt Wagner/Nightcrawler.